Chris Short won 135 games in his major-league career. He pitched 15 big-league seasons and was arguably the National League’s second-best left-hander in the 1960s after Sandy Koufax. From 1964 through 1968, an average season for Short consisted of 250-plus innings pitched, 190-plus strikeouts, and 17 wins. He was twice named to the All-Star team. Despite his accomplishments, Short’s place in baseball history was determined by two fateful weeks in the fall of 1964, when Phillies manager Gene Mauch sent Short and Jim Bunning to the hill to start eight times in the Phillies’ final 12 games. The Phils’ ten-game losing streak was baseball’s greatest collapse at the time. It turned a 6½-game lead with only 12 left to play into a bitter second-place finish. Chris Short played baseball at the Sunny Hills School in Wilmington (now the Sanford School) and in his high-school years at Lewes High School, near Rehoboth Beach. He was a hard-throwing prep pitcher, but also a wild one. An incident in the tenth grade in which Short hit a batter and knock him unconscious left Short uncertain he wanted to continue his baseball career. “I was real wild then,” he recalled in 1965. “I nearly broke out in tears. I didn’t want to pitch anymore. But my high-school coach urged me not to give up, said it wasn’t my fault.” 2 After three years at Lewes, Short enrolled at Bordentown Military Academy in Bordentown, New Jersey, for his senior year. 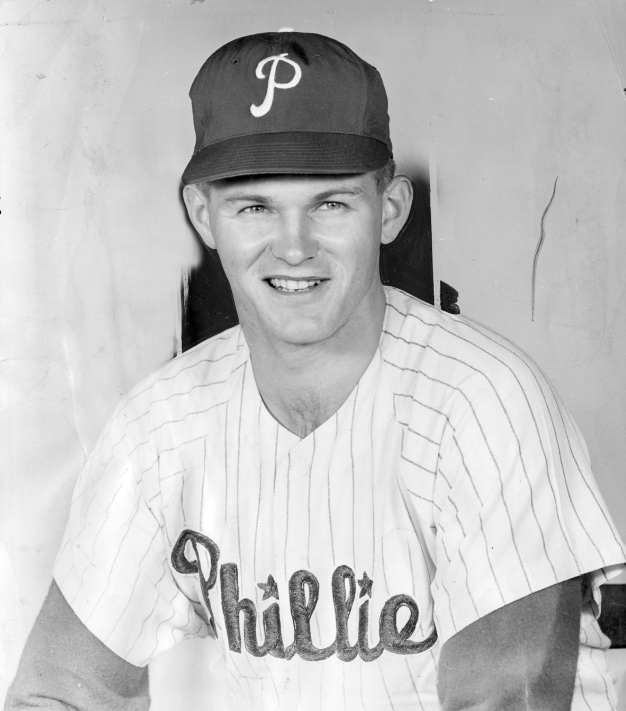 There, he struck out 147 batters in 83 innings, and ran his overall high-school record to 30-6.3 A Phillies’ fan, he elected to sign with Philadelphia over a dozen other clubs, inking his first professional contract with scout John “Jocko” Collins. The 6-foot-4-inch left-hander’s first professional assignment was with Johnson City Phillies of the short-season Class D Appalachian League. The 19-year-old Short went 9-2 with a 3.45 earned-run average. He moved up to Class B High Point-Thomasville in 1958, winning 13 games and losing 13, and when the Phillies broke spring training in 1959, the 21-year-old Short went north with them. He made his major-league debut on April 19 at Cincinnati, pitching 3? innings of relief after starter Jim Owens was knocked out in the second inning. Short gave up four hits, three walks, and five earned runs. He started two games for the Phillies without a decision, and in early May was sent to Triple-A Buffalo for the remainder of the season. In 1960 Short came back to the major leagues to stay (except for a three-game interlude in Triple A in May). He earned his first career win with a scoreless eighth inning in the Phillies’ 9-5 victory over the Cincinnati Reds on April 24. On June 11 Short pitched his first complete game, shutting down the Cubs, 7-1, and allowing only a solo home run to Ernie Banks, who hit nine homers off Short, more than any other hitter. In 10 starts and 32 relief appearances, Short was 6-9 with a 3.94 ERA. He was especially effective out of the bullpen, posting a 4-1 mark with a 2.50 ERA, but was just 2-8 with an ERA over 5.00. A tall country boy from largely rural Sussex County, Delaware, Short did not possess the standard demeanor of a major leaguer. As a young player, he earned the nickname “Styles” from teammates in light of his wardrobe. His luggage on road trips often consisted of a brown bag with an extra shirt, a hairbrush, and a toothbrush. Former Phillies center fielder and broadcaster Richie Ashburn recalled that Short would wash his underwear every night and hang it out to dry.4 The Phillies attempted to make him over by changing how he walked and getting him to start chewing tobacco, both of which efforts fell flat.5 Doug Clemens, who played with Short for three seasons with the Phillies, recalled Short as “a very unique guy, probably a bit naïve.”6 Baseball Digest referred to him as the “left-handedest left-hander the Phillies own, as consistent as a three-dollar watch.”7 But Short was a light-hearted type who accepted teammates’ ribbing and remained popular with them throughout his career. Quirky personalities are accepted inside a baseball clubhouse as long as the owner of those quirks performs well consistently. In the early 1960s, Short was anything but consistent, which led manager Gene Mauch to say that he would trade the lefty “for a bale of hay.”10 Short made 11 of his first 12 appearances in 1961 in relief before starting in place of the injured Robin Roberts against the Reds on June 18. He gave up six earned runs in a 10-0 loss. He started intermittently throughout the rest of the season, finishing with an uninspiring 6-12 record, a 5.94 ERA, and a league-leading 14 wild pitches. Meanwhile the Phillies made a move to solidify the front end of their pitching staff, acquiring workhorse right-hander Jim Bunning from the Detroit Tigers. Bunning’s impact on the Phillies was immediate and drastic, as he went 19-8 with a 2.63 ERA, not to mention a Father’s Day perfect-game victory over the Mets. In his book October 1964, David Halberstam suggested that Bunning’s acquisition allowed Short to blossom, freeing the talented lefty to pitch without the burden of carrying a pitching staff on his shoulders.14 Bunning and Short both talked openly about the friendly rivalry that developed between them as they sought to outdo one another, and this competition, more than the arrival of a presumed ace, is likely what carried Short to new heights. For 5½ months the 1964 season went as well for Chris Short as he could have hoped. After making eight of his first nine appearances out of the bullpen, Short entered the rotation in place of the injured Ray Culp in mid-May and never looked back, spending the rest of the 1960s as one of the pre-eminent lefties in baseball. He made his first All-Star Game in 1964, pitching the sixth inning of the National League’s 7-4 win, and his league-leading 1.58 ERA at the break remained under 2.00 virtually the entire year. On September 14 Short won his 17th game of the season when he pitched a four-hitter to down the Houston Colt .45’s, 4-1. Short made five more starts before the end of the season. The day after the Colts game, the Phillies began accepting applications for World Series tickets, and while still in Houston, several players went out and spent some of their presumed World Series bonus money. This group included Short, who purchased a pair of matching shotguns.15 But after Houston he won no more games that season. The Phillies left Houston with a six-game lead in the pennant race, and their lead rested at 6½ games with 12 to play when Cincinnati came to town on September 20. What happened over the next two weeks still makes Philadelphians of a certain generation awaken in cold sweats. With Art Mahaffey on the mound late in a scoreless game against the Reds on the 21st, Reds infielder Chico Ruiz stole home with Frank Robinson at the plate, bringing home the only run of the game and starting a ten-game losing streak for the Phillies that saw both St. Louis and Cincinnati move ahead of them. The Cardinals clinched the pennant on the season’s final day. Short pitched the day after the “Chico Ruiz game,” and gave up a season-high six runs in 4? innings as the Phils lost again. On September 25, in a move deemed by posterity to be indicative of panic, manager Gene Mauch started Short on only two days’ rest against Milwaukee. Short was often used in relief on his side days, but had been used on two days’ rest between starts only once in 1964, and that was two days after he lasted just an inning and a third against the Pirates. Against the Braves Short pitched gamely, allowing two earned runs in 7? innings, but the Phillies lost, 7-5, and the losing streak increased to five games. Two more days brought two more losses to the Braves, and with the losing streak at seven, Mauch again started Short on two days’ rest against St. Louis. The “visibly weary”16 Short was starting his fourth game in 11 days, and he lasted into the sixth as the Phils lost again, 5-1. On October 2, finally pitching on his customary three days’ rest, Short allowed one earned run in 6? innings, and the Phillies finally halted their epic losing streak at ten games with a 4-3 win at Cincinnati. An offday preceded the final game of the regular season, and while the Phillies routed the Reds, 10-0, only a Mets win over St. Louis could extend their season. The Mets fell to the Cards, 11-5, and the epic fold became a permanent scar on the psyche of Philadelphia’s sports landscape. Despite the collapse, Short’s 1964 season was highly successful on an individual level. It resulted in career bests in wins (17), innings (220? ), ERA (2.20), complete games (12), shutouts (4), and strikeouts (181). Short also established a season low for walks with 51. He finished in the top ten in the National League in ERA, strikeout/walk ratio, and strikeouts. Short entered the 1965 season assured a spot in the starting rotation for the first time. He started for the Phillies on Opening Day, his first of six such assignments. In Houston for the first game in the new Astrodome, Short dominated the Astros, throwing a four-hit shutout and striking out 11, as the Phillies won, 2-0. The game was the first of six that season in which he recorded double-digit strikeouts. The last of the six came in Short’s last outing of the season, and may have been the best performance of his career. Starting the second game of a doubleheader against the Mets in New York, Short pitched 15 scoreless innings, striking out 18 and allowing only nine hits. Mets starter Ron Gardner also threw 15 shutout innings, and after three scoreless innings from both bullpens, the game was called after 18 scoreless innings on account of curfew. The 1965 season continued to build Short’s reputation as a front-line starter. He finished 18-11 with a 2.82 ERA in 40 starts and 47 appearances overall. His five shutouts, 297? innings, and 237 strikeouts were the highest totals he would ever record. But the Phillies finished in sixth place, 11½ games off the pace. Heading into the 1966 season, Jim Bunning hatched a plan to gain both Short and himself a big raise. Emulating the model used by Dodgers aces Sandy Koufax and Don Drysdale before the 1965 campaign, Bunning encouraged Short to stage a joint holdout with him to force the Phillies to pay the salaries each desired. However, Bunning recalled that “Short was the worst negotiator. He always signed the first contract that (general manager) John Quinn sent him.”17 Apparently satisfied with his contract, Short signed after only a few days of holding out. Short proved again in 1966 that he was among the elite pitchers in the National League, putting up numbers comparable to 1965 and winning 20 games. With only one day of rest after his final start of the season, a complete-game victory over the Dodgers that pushed his record to 19-10, Short came on in relief against the Dodgers to pitch two scoreless innings in the Phils’ 4-3 win to get number 20. He became the first Phillies left-hander since Eppa Rixey in 1916 to win 20 games. The durable pitcher posted a career-best 19 complete games in his 39 starts. Short missed six weeks in May and June of the 1967 season with a knee injury suffered in a collision with teammate Doug Clemens during batting practice.18 He won only nine games and lost 13, but rebounded in 1968, going 19-13. Short established team records for shutouts (set with a four-hitter over the Dodgers on Opening Day 1968) and strikeouts by a left-handed pitcher, both marks previously held by Curt Simmons. In 1967 Short was named to his second All-Star team. (It was the last All-Star selection for a homegrown Phillies left-hander until Randy Wolf earned the honor in 2003.) Gene Mauch was let go as Phillies manager at the end of the 1968 season. Short had a good spring with the Phillies in 1970, and hopes that he would return to dominant form rose when on Opening Day he shut out the Cubs on five hits. But he was unable to return to his previous level of success after the back surgery. He was 9-16 in 1970 and 7-14 in 1971. In 1972 he was 1-1 in 19 relief appearances (no starts), and he was released after the ’72 season. He finished his career as a reliever and spot starter for the Milwaukee Brewers in 1973. Though Short’s name does not appear on even a single Phillies’ “top ten” list in a major statistic for a single season, he ranks among the team’s career leaders in wins, wins (fourth, with 132), games (fifth, with 459), innings (fourth, with 2,253), strikeouts (third, with 1,585), and shutouts (fourth, with 24). Short entered the insurance business in Delaware and continued to pitch in local beer leagues. Always a husky fellow who enjoyed beer, he was diagnosed with diabetes several years after his playing days ended. Nothing, however, could have prepared anyone for the events of October 20, 1988. On that day, Short collapsed at his office in Wilmington, Delaware, the victim of a ruptured brain aneurysm. He was found semiconscious by a co-worker several hours later, his knuckles, knees, and ankles skinned, apparently from trying to move to get help.21 He spent 13 months at nearby Christiana Hospital, before winding up in a Wilmington convalescent home. As the time increased, so too did his medical expenses. Short’s former Phillies teammates showed the depth of their respect and their admiration for him by coming to his aid. Former roommate Art Mahaffey organized yearly celebrity golf tournaments, with all of the proceeds sent to an account used for Short’s expenses. The 1990 event drew nearly 300 participants, including representatives from all four of Philadelphia’s major professional sports teams. Having never regained consciousness, Chris Short died on August 1, 1991, at a Wilmington convalescent home. He left behind his third wife, Pat, as well as three sons from previous marriages, Rhawn, Nickey, and Eric. He was buried at Union Cemetery in Georgetown, Delaware. His headstone features a sketch of him on the mound delivering a pitch in the middle of a baseball diamond. Above his name is a Phillies cap, and beneath the sketch of him is his nickname, “STYLES.”23 No epitaph could sum up Chris Short better. In addition to the sources noted in this biography, the author also accessed Ancestry.com, Baseball-Reference.com, and Findagrave.com. 2 Philadelphia Inquirer, August 2, 1991. 3 Doug Gelbert, The Great Delaware Sports Book (Montchanin, Delaware: Manatee Books, 1995). 4 Philadelphia Inquirer, August 2, 1991. 5 Baseball Digest, June 1968. 6 Fran Zimniuch, Phillies, Where Have You Gone? (Champaign, Illinois: Sports Publishing LLC, 2004). 7 Baseball Digest, December 1963. 8 Philadelphia Inquirer, August 2, 1991. 9 Gettysburg (Pennsylvania) Times, September 10, 1964. 10 Rich Westcott and Frank Bilovsky, The Phillies Encyclopedia, 3rd Edition (Philadelphia: Temple University Press, 2004). 11 The Sporting News, March 9, 1963. 12 Modesto (California) Bee, December 15, 1963. 13 Baseball Digest, December 1963. 14 David Halberstam. October 1964 (New York: Fawcett Books, 1995). 15 William C. Kashatus, September Swoon – Richie Allen, the ’64 Phillies, and Racial Integration (State College: Pennsylvania State University Press, 2004). 17 Frank Dolson. Jim Bunning: Baseball and Beyond (Philadelphia: Temple University Press, 1998). 18 Spartanburg (South Carolina) Herald-Journal, May 25, 1967. 19 Sarasota (Florida) Herald-Tribune, June 11, 1969. 20 The Sporting News, November 22, 1969. 21 Philadelphia Daily News, May 31, 1990. 23# FindAGrave.com Chris Short Page. http://www.findagrave.com/cgi-bin/fg.cgi?page=gr&GRid=14612514.